For the most part, today’s work focused on cleaning up the existing excavation units and taking formal photographs of the profiles of the earthen walls. The archaeologists spent a lot of time troweling and brushing the vertical faces of the units—from the surface to a depth of about five feet in the main unit—in order to clearly distinguish the many layers of sediment and fill. 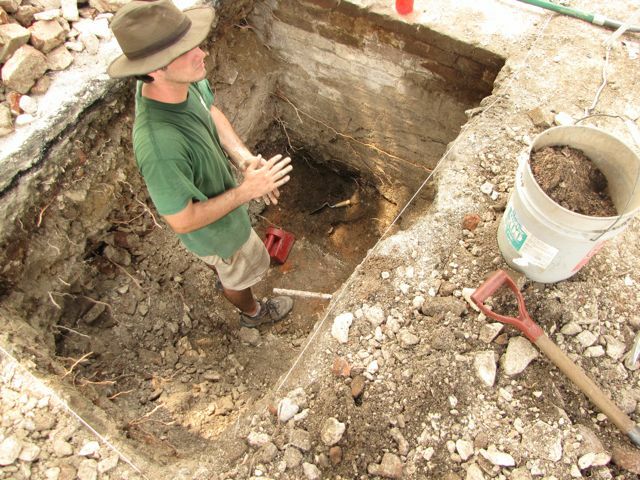 This kind of detail work is important for preserving a reliable record of the downward progression of the dig, which enables the archaeologists to establish reference points for dating the artifacts recovered from the soil. Speaking of artifacts, the students screened less dirt today than usual, and the sort of artifacts they found were essentially more of the same—mid-eighteenth-century ceramics, glass, and pipe stems. Nothing especially photogenic came to light, so I have no interesting photographs to share today. 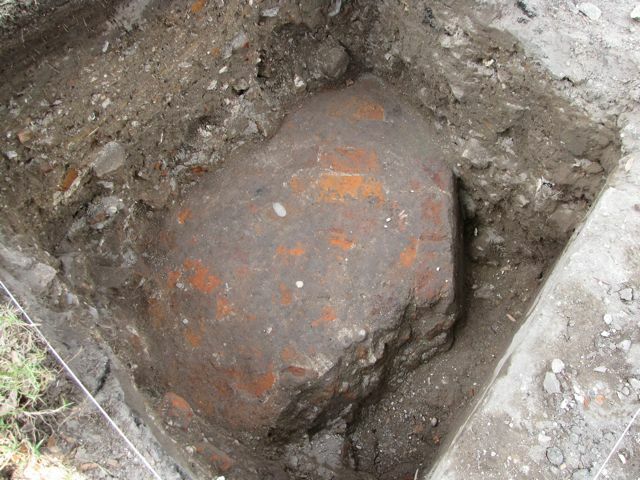 As mentioned last week, the archaeologists have located another portion of the redan wall in a unit just a few feet southwest of that pictured above. 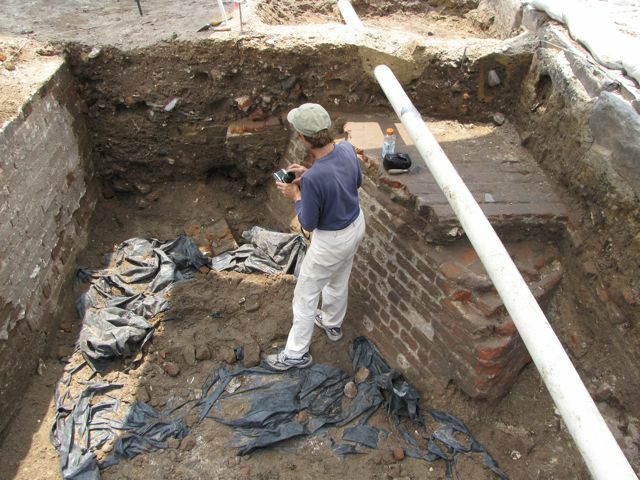 We won’t be able to explore much of this portion, however, because it’s bounded on the north by utility conduits and to the south by the brick foundation of Vanderhorst’s North Row (see the photo to the left). Nevertheless, today brought new hope for finding further parts of the wall. 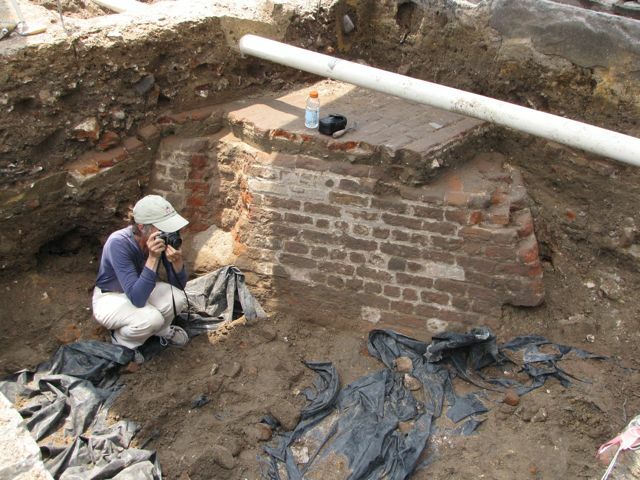 Students digging in the westernmost unit, closest to East Bay Street, finally located part of the redan wall in that unit. 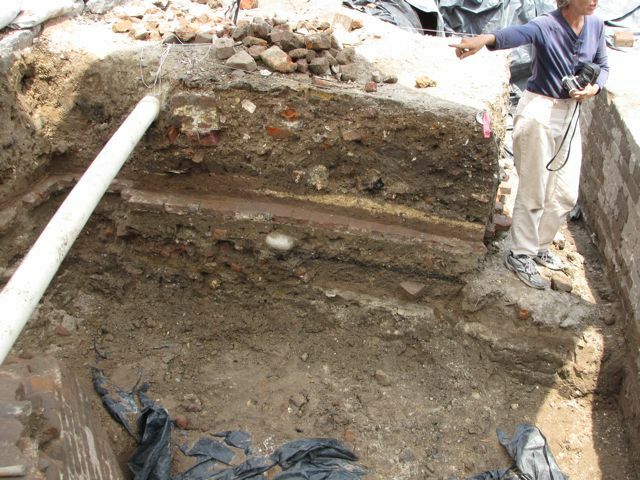 Since this unit is located on the south side of the brick foundation of the building known as Vanderhorst’s North Row, it appears that a significant portion of the upper parts of the redan wall were obliterated when that building was constructed ca. 1805. As a result, the student archaeologists had to dig to depth of about five feet just to locate the red-orange bricks signalling the top of the redan (see the photo at right). Thanks to their perseverance, we are now able to trace the line of the redan about twenty-odd feet southwestward from its apex. In the coming days, this westernmost unit will probably be expanded to allow a better view of this part of the wall. Better images yet to come!